The Massachusetts Conference, as a representative of the wider United Church of Christ, has had a longstanding partnership with the Pentecostal Church of Chile. We have lived out this exchange through delegations of young people and adults in both directions, including participation at each church's annual meetings, joint Chilean/American youth choirs, sister church relationships, support for women's organizations and micro-financing programs, work groups, homestays, and retreats to Centro Shalom, in the Andes Mountains. Most recently, our work has focused on recovery from the devestating earthquake and tsunamis which occurred in February of 2010. In this, as in all aspects of our partnership, we find that we gain as much as we give, and often more, and that our faith is renewed and deepened through the relationships we develop and the inspiration we receive from our work and worship together. For more than 27 years, this partnership between the Massachusetts Conference of the United Church of Christ and the Pentecostal Church of Chile has brought spiritual vitality and social awareness to congregations in both countries. We have nurtured each other in the aftermath of natural disasters, and young people in both countries have learned to appreciate other cultures and distinct ways of worship while forming lasting friendships. In short, this is a life-changing ministry. This letter is an invitation to you and your congregation to participate in a partnership project with great potential for ministry—building Sister Church relationships. When Chile was hit by a devastating earthquake and tsunami on February 27, 2010, the churches of the Mass Conference responded boldly with a promise that none of our Chilean Pentecostal sisters and brothers would be left homeless. The Lifting Up Hope campaign enabled the Pentecostal Church of Chile to build more than 300 Blessing Cabins for church members who lost their homes. Our response was about more than money and houses. It was an expression of our spiritual connection. “Through the response of the churches of Massachusetts, we knew that our sisters and brothers felt our pain and suffering in their own flesh and blood” were the words used by Bishop Ulises Muñoz in response to Lifting Up Hope. 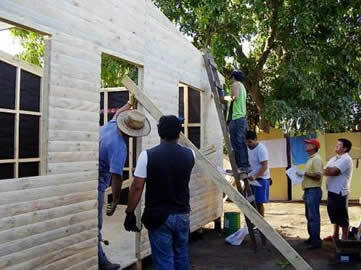 While Lifting Up Hope, provided emergency housing for families, serious damage to church buildings has gone un-mended. The pastors and leaders of the Pentecostal Church of Chile are inviting churches in Massachusetts to form Sister Church relationships with Chilean churches severely affected by the earthquake to address the reconstruction needs of those churches. In each community, church leaders have identified reconstruction projects that could be accomplished for approximately $5,000. We are inviting you to enter into a three-year covenant with one of these churches. During the first two years, your congregation would commit to raising $5,000 to support the projects of your sister church. In the third year, you are invited to participate in a delegation to visit your Sister Church community. Smaller churches in Massachusetts may wish to consider joining together to form a consortium to partner with one church in Chile. In addition to financial support, the Sister Church relationship is built upon a foundation that includes ongoing sharing prayer concerns, information, and the joys of our common ministry in Jesus Christ. On one visit to Chile, I was told that this aspect of the partnership is perhaps even more meaningful to our Chilean partners than the financial aid we can offer. I hope that you will prayerfully consider participating in this project. If you are interested in learning more about this ministry opportunity, please contact the Rev. Kelly Gallagher at gallagherk@macucc.org. Young Sarah Myntti was looking for adventure last summer; what she found were new friends and a new sense of connection. Christmas gift idea: Chilean/USA Youth Choir CDs! A past participant in an MACUCC-sponsored trip to Chile talks about the profound impact this experience had on her life.